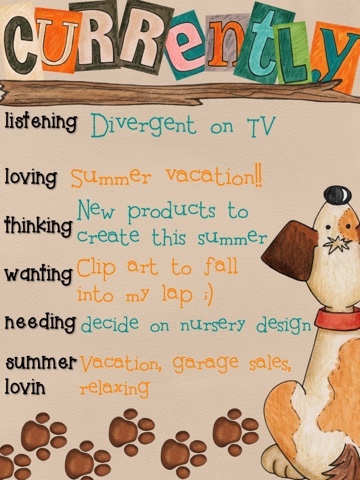 It's June and I'm linking up with the currently of the month from Oh Boy 4th Grade! Loving: Today was my first day of summer break and I love sleeping in!! I felt productive today, did laundry, made a rhubarb crisp, and started and finished a new journal pack! Thinking: I have so many ideas for products to create this summer! I just need to get my thoughts organized :) But I'm really excited to make some new things to use in my classroom next year and to help others out as well! Wanting: Seriously, I spend way too long looking for the perfect clip art. I wish it would just come to me! The struggle is real, people!!! Summer loving: My husband and I are going on vacation to Sanibel Island next week, over our anniversary and his birthday as our "babymoon." So I'm excited about that! I'm also looking forward to going to lots of garage sales this summer and hopefully finding lots of baby stuff, including big stuff like the crib, dresser, and glider for the nursery! And of course, what teacher doesn't love that summer is a perfect time to relax and do whatever we want to do on our own schedule. Love it! Summer break is amazing isn't it?! Enjoy your vacation and getting everything ready for your nursery. I love summer break too and I am getting ready to go and meet my newest grandchild out in CA in a few weeks. Congratulations on your new addition and they have some really CUTE "wall pops" that are elephants if you google for them. Take pictures of the nursery when you get it finished because I LOVE elephants too and I would love to see it. Good luck finding things for the nursery! We just started looking, too. We're going to do mint green walls, white furniture, and then some accent colors. Thanks! And good luck to you too! And congrats :) I love mint as well, that will be so cute!!! Enjoy your Summer break! Sounds like you have a wonderful Summer planned. I love the sound of what you're going to be doing to your nursery! When i'm stuck i always go to pinterest or instagram and try to search for things i want to get different ideas to merge together! Sounds like such a fun experience for you - enjoy it! Have a fabulous vacation! I put elephants on our nursery wall - and a giraffe and monkey! We did a jungle theme obviously. My husband and I went on a babymoon too - to Niagara falls in February - it was COOLD! I hope your babymoon is a bit warmer. Enjoy your summer!